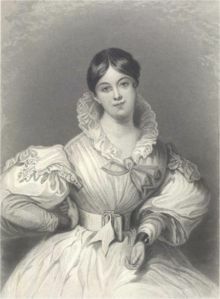 Although Letitia Elizabeth Landon, is relatively unknown today, the work of this beautiful, young English poetess and novelist of the late Georgian and early Victorian period is resurfacing with fascinated interest and feminist criticism has given critical interpretation of her work another perspective. She was born (1802-1838) into the lower middle class, only to become in her teenage years, a published poet, and eventually the most successful poet of her day. Her verse reveals a highly intelligent and emotional intensity. She wrote of passionate love at a time when women were conventionally restricted in their themes making her the favorite among the literary intelligentsia, known to her devoted readers as simply L.E.L. Her success as a young single woman carving out an independent career in the tough arena of literary London in the 1830’s recognizes her as a gentle woman determined to succeed beyond her dreams. Landon’s body of work is an impressive achievement but her mysteriously scandalous life and early death is once again being scrutinized. . THE SCANDAL OF LITERARY ENGLAND Landon’s writing observed today exerts a powerful fascination in the vividness and musicality of her distinctive voice. Her typical themes are about “Sorrow, Beauty, Love and Death.” The influential London periodical, the Literary Gazette began publishing her poetry at the age of seventeen. It is rumored that she had a long-term illicit affair with an older, married neighbor who is also the editor who published her first poem. The gossip mongers and letters circulated among London's social set about Landon and her lifestyle. When she escapes to the countryside every few years the rumors circulate: “Is it to bear his illegitimate children?” Rising above the tide of criticism she wrote movingly of romance and continued to partake in her high-spirited social life. LANDON’S PROLIFIC OEUVRE Landon’s voluminous publications are now again in print and renewed recognition of Landon’s impressive achievement may be due in part to the largess of the exhibit, "The World of Letitia Elizabeth Landon: A Literary Celebrity of the 1830s," which showcased at the Grolier Club in New York in 2011 with manuscripts, first editions, prints, photos and other materials, which illuminated the life and art of this outstanding British writer. Today Landon is attracting attention for her unbridled success as a poet and novelist. Her oeuvre was prolific. THE POETESS and NOVELIST In the eight years that followed the publication of Landon's first volume of verse in 1821, it and the eight collections that followed were extremely popular. Landon wrote reviews, articles, and stories for many London journals. In 1824 her volume of romantic narrative poems, "The Improvisatrice," became a major best seller. In 1831 Landon published her three-decker novel, "Romance and Reality," followed by successful historical novels, Francesca Carrara (1834), and Ethel Churchill (1837). Landon’s celebrity was widespread and her writings were translated into French, German, and Dutch, and distributed widely from Paris to St. Petersburg. She was no shrinking violet. Famous writers who counted among her admirers included Hawthorne, Whittier, Poe and many other prominent American authors. MARRIAGE AND MYSTERIOUS DEATH The subject of Landon’s romances is both mysterious and questionable. After the scandal of her teenage romance with a married man, her first editor, she later was engaged to one man or another, only to have those engagements broken by rumors. Why Landon finally chose to marry a man who would take her to far off Africa is yet another mystery. In 1838 Landon married George Maclean, a colonial official, possibly an abusive man, who sweeps her away to Cape Coast, West Africa (in present-day Ghana), where the lonely, often ailing, poetess is found with a vial of prussic acid in her hand, slumped against her bedroom door. Mysteriously dead at the age of 36, the question still remains. Is it by her own hand? Did she administer the elixir as a medicine, was it an accident? suicide? or was it murder? The answer is still pondered, but conjecture suggests that Landon was taking the prussic acid to soothe a stomach ailment.